Steve and I were en route to Stowe, VT and needed to stop for lunch. He did a quick Yelp search and found Molly’s in Lebanon. It looked so promising: wood fire oven and complimentary hot bread and honey butter to start. I opted for their lunch special ($11 for soup or salad with ½ of any pizza). Steve ordered the fire-roasted vegetable salad ($12). 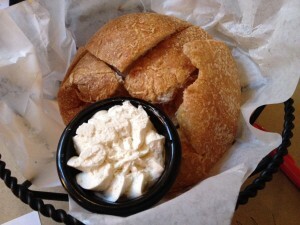 The aforementioned bread was mediocre; the crust was flaccid and the interior was spongy. 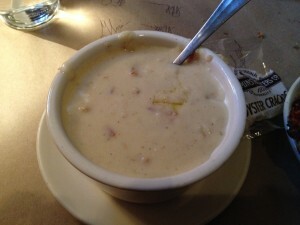 I choose the soup of the day - bacon cheddar soup. It was indistinguishable from a gluey potato chowder. 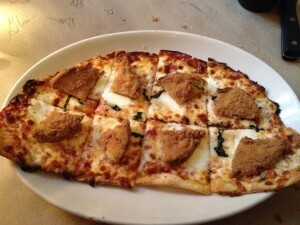 My eggplant pizza was strange; as you can see from the picture, each piece had one thick breaded wedge of eggplant. The dough was awful. Steve’s salad was drowning in dressing. He shrugged and said it was “okay,” He is not one to complain about food. He did enjoy his beer. The service was friendly, but I will be sure to do my research before next year’s Stowe trip. Next time try Tooky Mills Pub & Restaurant on your way north. Indoor and outdoor lunch/dinner with great beer/wine options.